Reviewing the Genesis readings from this week’s Presanctified Liturgy, I’m struck by the recurring theme that we saw from the very start of the creation stories: We humans are in conversation with God and all is good; then, we humans mess up, so to speak. We engage in dishonesty, betrayal, jealousy, greed . . . We mess up the goodness and push God’s patience beyond the limit: hence, expulsion, flood, babel, Sodom & Gomorrah. It looks like we humans don’t learn from our mistakes! Nevertheless, astonishingly, God manifests unlimited patience, continuing to speak to us, telling us of our capacity for goodness and love. Throughout the ages, humanity has always been given another chance, despite our track record. I speak of a collective us and we, because through Christ we know that we are as interconnected as parts of a body or branches on a vine. Only together can we glimpse our wholeness and recognize divinity in our world. Through Christ we see God as human and we see how we can live to the fullness of our humanity. Yet, even with God as our brother, we humans rejected God’s incarnate goodness and, unleashing our worst traits, we tortured and sentenced goodness to death (all in the name of righteousness and law). We really really messed up. God: infinite patience. Infinite love. 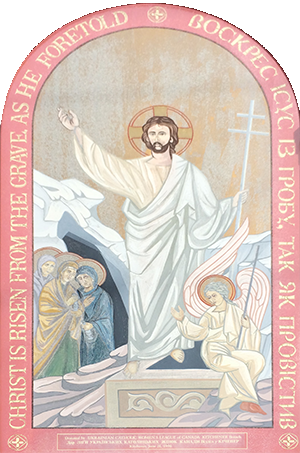 Year after year, we celebrate the Resurrection, not as an historical event—but as the miracle of miracles: we humans cannot kill love; we cannot destroy God. God gives us life, in all its wonder and joy. We humans bring the darkness to reign, but in recognizing the light of Christ we become the vessels of God—here and now. What can I do to care for the environment? In the face of environmental devastation and political unwillingness to realize unpopular changes to industries and economies, we might feel that our actions are irrelevant. But it’s not so. As Christians we know that there can be hope and power in every individual—and together we are stronger. Care for the natural world around us is an attitude that can come with our desire to be like Christ and see all life through a prism of love. We, as individuals, are always in a process of development. We can imagine our personal growth as being both creations and creators. Follow this link to a list of suggestions for environmental care. Some are small and some are large; easy, difficult, some possible, others impossible—depending on our context. But all are positive actions of love for God’s creation—for us—for humanity. Read the report on an important intervention by Cardinal Blase Cupich at the Vatican summit “On the Protection of Minors in the Church”. Last week we looked at how our faith, that mirrors the Trinity, cannot escape any aspect of our daily life. How we see the world, how we vote, spend money, treat others—everything can be imbued with our refreshed mindfulness of the Sacred. We’ve often talked about the sacred aspect of water: every year when Father blesses the Jordan water, we renew our gratitude for this essential element of life. As Christians living in our world today, we must protect and care for the natural world including our water sources, which are exploited and endangered by what can be called corporate greed. One way to start is to recognize the harm caused by the bottled water industry. Let’s take a stand against bottled water and the devastation caused by corporations such as Nestlé. We can be informed about unethical practices around, and sourcing of, products, so that, as much as possible, our buying power will support a better, more caring world. Bishop Crosby (RC Hamilton diocese) in keeping with Pope Francis, has asked the faithful to reject bottled water. We too must follow this lead! All parish events cancelled today. Stay warm and safe indoors. Today the ecumenical movement is alive globally. It is unstoppable. Thus it is important for our sister church, the newly-born Autocephalous Orthodox Church of Ukraine, to take part, and avoid isolation. The search for universal unity between Catholic and Orthodox Churches is vibrant in Ukraine. No wonder St. Pope John Paul II once called Ukraine a “laboratory of ecumenism.” Therefore, cooperation with the Ukrainian Autocephalous Orthodox Church is essential. We have agreed with His Beatitude Epiphanius, to work out a “road map” in order to see in which parts of our church life we could indeed do things together. 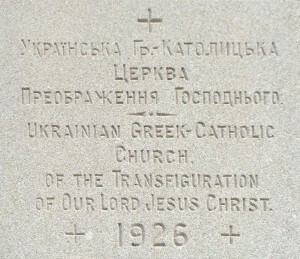 Every effort must be made not only to overcome the division within Ukrainian Orthodoxy, but also to seriously theologize, pray, and work in order to restore the original unity of the Church of Kyiv in its Orthodox and Catholic branches. The UGCC carries the mystical ecclesiastical memory of the undivided Christianity of the first millennium and, although we live in full communion with the successor of the Apostle Peter, we recognize that our Mother Church is the Church of ancient Constantinople. Before our celebration of Christ’s nativity, we bid each other “smachnoi kuti”, in effect saying “enjoy your delicious kutia!” This mention of kutia also can be a metonym for the Sviata Vechera or Holy Supper: may our 12 dish ritual meal, in honour of the sacred event of the Incarnation, be blessed and good. Each Holy Supper, on each Christmas Eve, begins with a spoonful of kutia; each person at the table obliged to have at least a taste in order to take part in the great mystery of Christmas (Heaven and Earth as One). On the eve of the feast of Jordan—the Theophany—when through Christ’s baptism we recognize God as three, our Ukrainian tradition is to repeat the “Sviata Vechera”. This meal called spil’na (communal) Kutia, significantly, is eaten with the parish community. Rather than on the Eve of Theophany, our parish family will share this meal on the closest Sunday—this Sunday, Jan. 20th. Have you wondered why these momentous occasions are associated so integrally with this one dish, that we rarely see, except during this cycle of religious feasts? Kutia, despite its endless variations in Ukrainian kitchens, is essentially comprised of 3 ingredients: cooked grain, poppyseeds, and honey. The recipe predates Christianity, yet we know that even in ancient pagan traditions, it was used as a ritual food, carrying deep symbolic significance that today is reinforced when we see that the miracle of Christ’s birth reaches all creation and all time: past as well as present and future. So, let’s reflect on this delicious, meaningful dish that we make each year and (in our home) fling to the ceiling with delight. Whole grain (wheat). Wheat is a symbol of life. It grows from a tiny seed and eventually becomes the “daily bread” that nourishes and sustains us. Without food we die. Even one spoonful of kutia consists of multiple grains. In life we cannot exist in isolation. We need each other to live. Wheat harvests not only provide food, but also the seeds for future sustenance. Wheat is also a metaphor for all humanity, generations past and still to come. The meaning of grain, on reflection, is not finite—we could think of ever more and deeper ways it reflects our being. But what about poppyseeds? 3. Honey? Mixed with the significant grain, the dark, bitter seeds symbolize the dark, bitter elements of existence that become palatable with the goodness and sweetness of life—symbolized, of course, by the honey. Together this dish of kutia, consumed during the times we especially celebrate God becoming human, becomes sacred in itself. God with us (Emmanuel) is life itself. God gives us life and grace. We, as a family, as a community of faith, share life itself. We share God in each other. We nurture, sustain, and enrich each other. The Sheptysky brothers (Roman and Casimir) were born into the aristocratic and polonised family of the Earl Jan and Sophia (née Fredriv) Sheptysky. Roman, at a very young age entered the monastic life, accepting the name Andriy. Soon after he became the great metropolitan of our Church. His brother Casimir chose a secular career, completing a doctorate in Law in 1892. However, his success as a lawyer, politician, and social activist did not satisfy him and in 1912 he too became a monk and accepted the name Klymentiy. As a priest-monk he was a key leader in the growth of Studite monasticism in Ukraine, as the main editor of the order’s statute and, from 1926, as the superior of the Lavra in Univ. During WWII he became a very important assistant for his brother, Metropolitan Andriy. He was secretly named the Exarch for Russia and Siberia and he organized a secret system for saving Jews from Nazi persecution in Galicia. In 1944 he headed the official Church delegation to Moscow for negotiations with the occupying Soviet authorities. He was arrested in 1947 and sentenced to a Siberian camp, but due to poor health he remained in the special prison in Vladimir where he died on May 1, 1951. Klymentiy was buried (without a marker) in a hole dug under the prison walls. Our tradition of iconography gives us a window into the miracle of Christmas in a way that extends beyond words. In contrast to the sentimental depictions of a cherubic baby sleeping in a manger seen in Western art, images in the Nativity icon appear austere, dark. However, when we recognize the symbolism in this icon, it offers an inexhaustible meditation on our humanity and the mystery of life, death, suffering, and joy. Central to the scene is Christ, newborn, yet his swaddling clothes are like the wrapping of a corpse; he lies in a coffin; his face is adult. The heavenly star points to Him—our God—born as a person, dying as a person. We see time as eternal: past, present, future, focused on the incarnation of God in Jesus. As if in a concentric circle, radiating from the center, the Godbearer, Bohorodytsia, lies near her son, turned away, exhausted, embodying the pain intrinsic in giving, living, and ending life here on earth. The mother and son are encircled by the natural world: earth, stone, mountains, trees. Within this universe are angels, shepherds, wise men; on the lower left is Joseph being tempted to disbelieve his wife’s innocence; on the right are midwives, bathing the infant. Note these women, tending to the basic human process of birthing; but they pour water into what might seem to be a baptismal font, or even a chalice. . . Who are these women? Ordinary working women? Neighbours? Do they represent ordinary folks like you or me? Might that mean that you or I have something to do with God bearing? Or baptizing? Or . . . ? Just one small corner of this icon leads us into contemplation of our role in bringing the presence of God to the world. What else does the icon reveal? 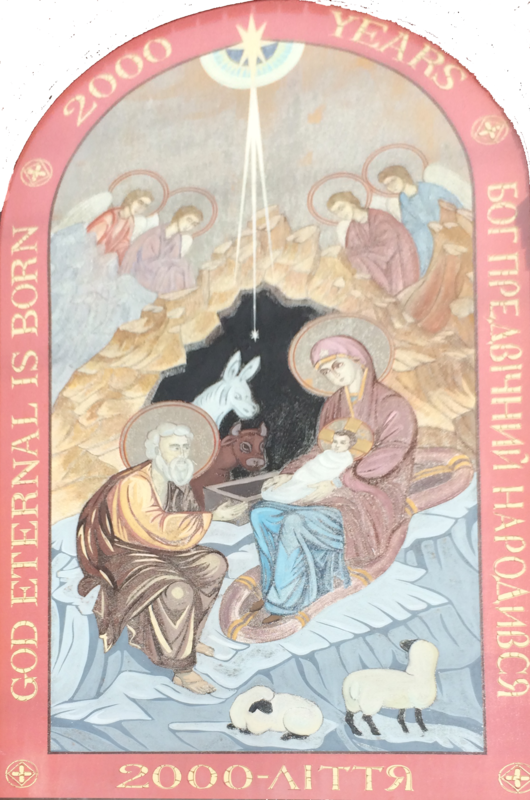 The nativity icon invites us always into deeper, broader, richer knowledge of Christ in me, in you, in others, and in us. Our parish follows the ancient Julian calendar and as such we celebrate the Incarnation (Christmas) on January 7th (see the Christmas Ordo 2019 for services). However, we unite in best wishes to all those who are celebrating Christmas on December 25th. May the Lord’s coming remind us all of the great gift of Love that we have been granted and are called to share with all around us, especially those who are marginalized in our society and around the world. Let us glorify Him in word and in deed!